I played with the idea for a little while because I did not want to make any pizza crust, but I wanted to be original. It meant I would have to start messing with some flour and yeast and as I have said before, I do not like the stress of flour. After I looked online, I decided to make the dough by myself; using some active yeast. I was doing too much amebo on Nollywood and my pizza almost burnt kaii! 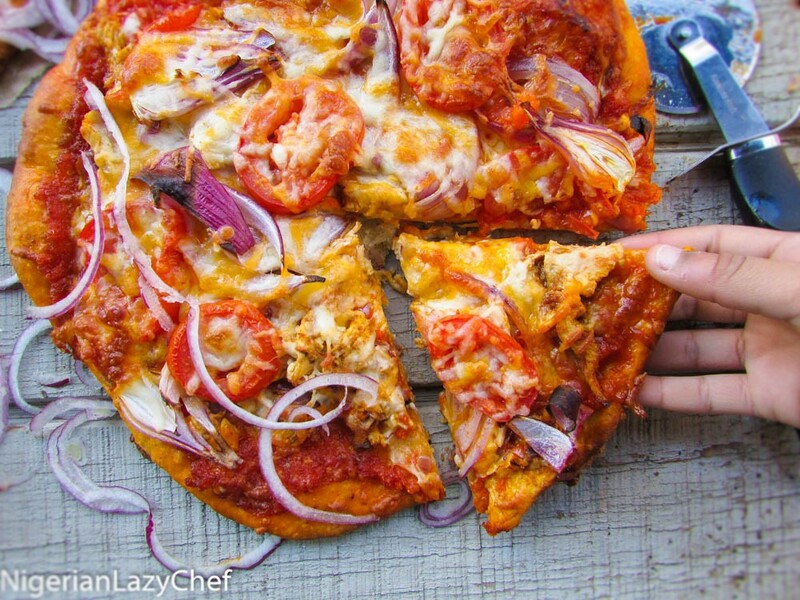 The wonderful thing about this pizza is the crust. Although, I do like deep dish pizzas, the thin crust wins for me every time. I know some #fitfam people will instantly say “why pizza? is it not fattening?” Well, I will say this; it is not the pizza that is to blame, it is those who eat the pizza excessively, it is those that do not exercise. How about self control and portion control and using healthier ingredients? Abeg make pizza oh! to form the dough mix all the dry ingredients and mix in the water and the oil. if dough ends up too hard, add some water sparingly to soften. if dough ends up too soft add some sprinkles of flour to smoothen. Brush the dough with a tsp of oil and cover in a bowl in a slightly warm place for about an hour. blend tomatoes, onion, garlic clove, red bell pepper, and ata-rodo. are slightly golden brown; then finish off in the oven at 350 degrees. If you do not have an oven, you can use your stove stop and sear on medium heat until cooked through. (Let the cooked chicken rest for about 10minutes to keep it from loosing it's juices when cut; then chop or cut it into bite sized pieces). 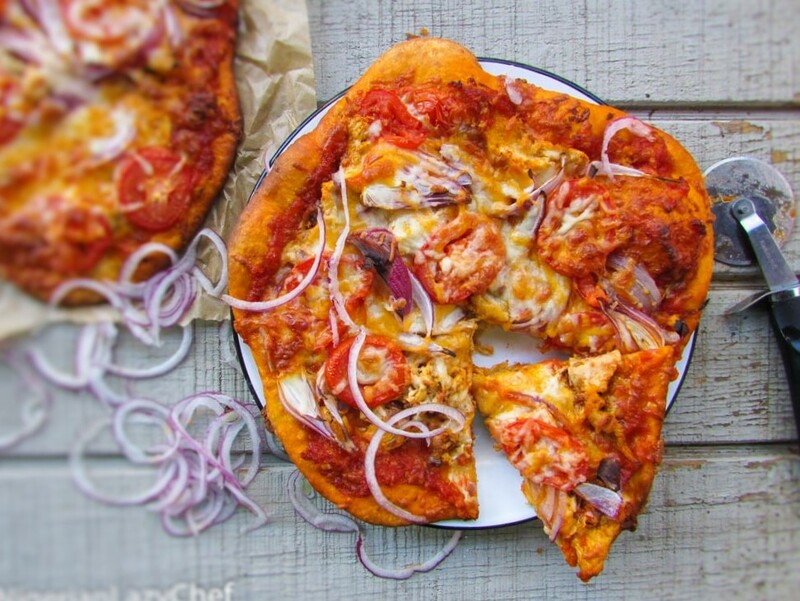 Toss the chopped chicken with the pizza toppings and set aside. After an hour, punch down the dough which must have doubled in size. Preheat the oven to 400 degrees. Knead the dough lightly on a slightly floured work top for about five minutes and flatten with a rolling pin and your hands. Using a brush, brush the remaining 1tsp of olive oil onto the sides of the now flattened pizza dough. 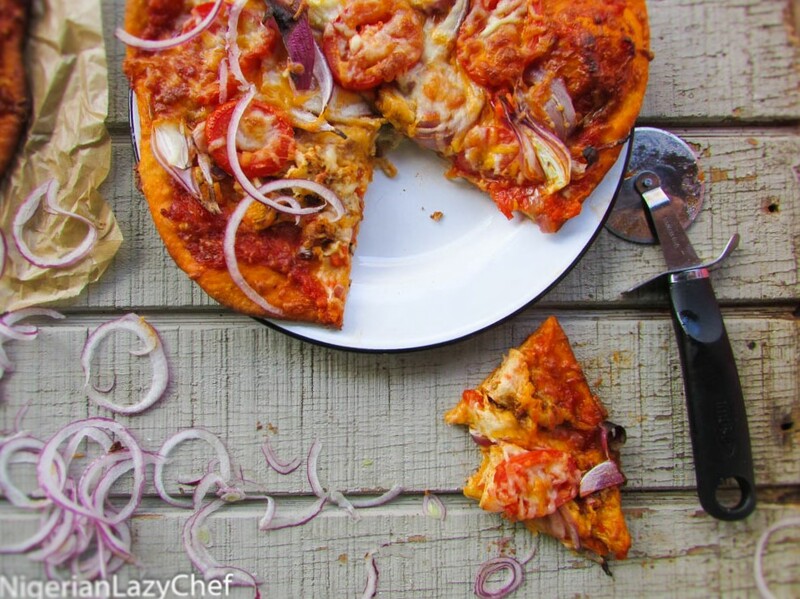 With a ladel spread the cooked sauce onto the pizza dough and spread the toppings on to the pizza. Bake in the oven at 400 degrees for 8-15minutes or until cooked through. Ps: You may use beef if you would prefer. If you are part of the #Fitfam, you may use wheat or white wheat flour. For Vegans and Vegetarians, you may use Tofu for chicken or just toss your choice of vegetables with some yaji powder and viola! 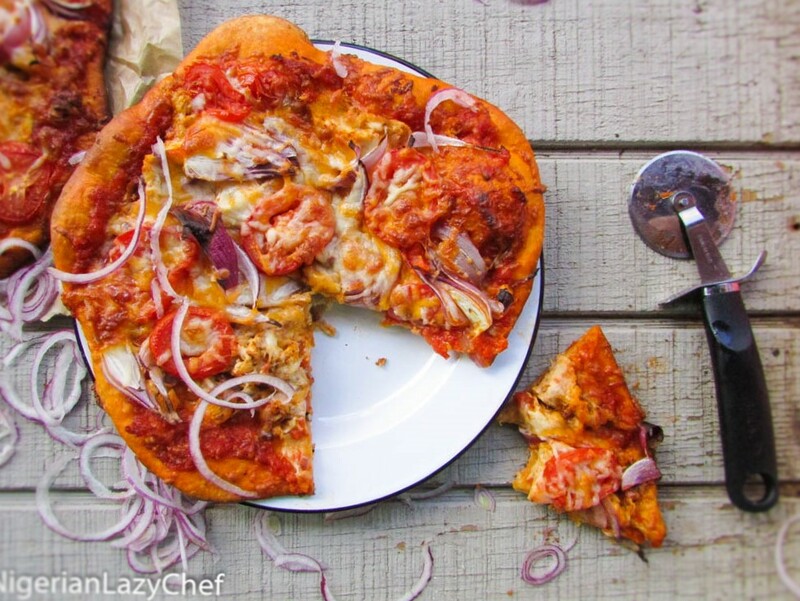 This entry was posted in Carbohydrate, chicken, chicken dishes, Chicken Recipes, Nigerian Suya, pizza recipes, Uncategorized and tagged chicken suya pizza, chicken suya recipe, Nigerian food blog, Nigerian Pizza recipe, Pizza recipe, suya pizza, suya pizza recipe, Thin crust pizza recipe. Thank you for the recipe. Please what type of cheese did you use. It’s good that someone is finally uplifting the finesse of the Nigerian Kitchen. I don de get twisted tongue gan.